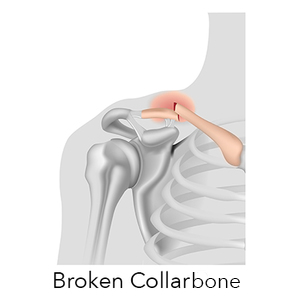 A broken collarbone (also known as a clavicular fracture) most often happens from falling and landing directly onto your shoulder, such as while bicycling, skiing, or snowboarding. The collarbone, or clavicle, is directly under the skin with very little overlying tissue, which makes fractures visible to the naked eye. Sometimes, the fractured ends of the bones can even protrude through the skin. Clavicular fractures are generally very painful at the time of the fracture. The clavicle is challenging for your body to heal on its own, as an immobilizing cast cannot be placed correctly around the fracture. In a less serious fracture, when the broken ends of the bones don’t overlap (less than 1.5 cm), the collarbone can heal without surgical intervention. We recommend treating this fracture with a shoulder sling for immobilization and gentle range of motion exercises. "Displaced clavicle fractures hurt and cause permanent shoulder weakness if not repaired out to full length. I can usually repair the fracture with a screw that goes inside the bone rather than a traditional metal plate and screws on the outside of the bone. This brings your broken collarbone back to normal alignment and length. There are cosmetic advantages too. 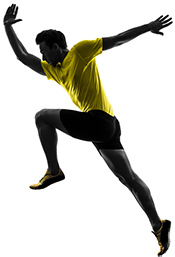 This type of technique gets you back to work and sports faster, in days rather than months." In more severe fractures, when the broken ends of the bones are separated by more than 1.5 cm, or the bone pieces are angulated, or when the clavicle is broken into several parts, it is often best to repair the fracture surgically. Surgery to repair a fractured clavicle is being recommended more often in order to promote proper and complete healing. Recent studies have implied that non-surgical treatments (leaving broken clavicles to heal on their own) may not have complete healing, and can cause long-term shoulder pathology. Typically, a repair without traditional metal plates and screws can be performed using a novel technique preferred by Dr. Stone. It's called an intramedullary fixation technique, where we are able to pass a screw down the bore of the clavicle in order to straighten it out and permit it to heal. It's a minimally invasive procedure, which gets patients back to activities in days rather than months.